At Focus Insite, and our “Get Paid Medical” brand, we recruit patients for various medical studies. 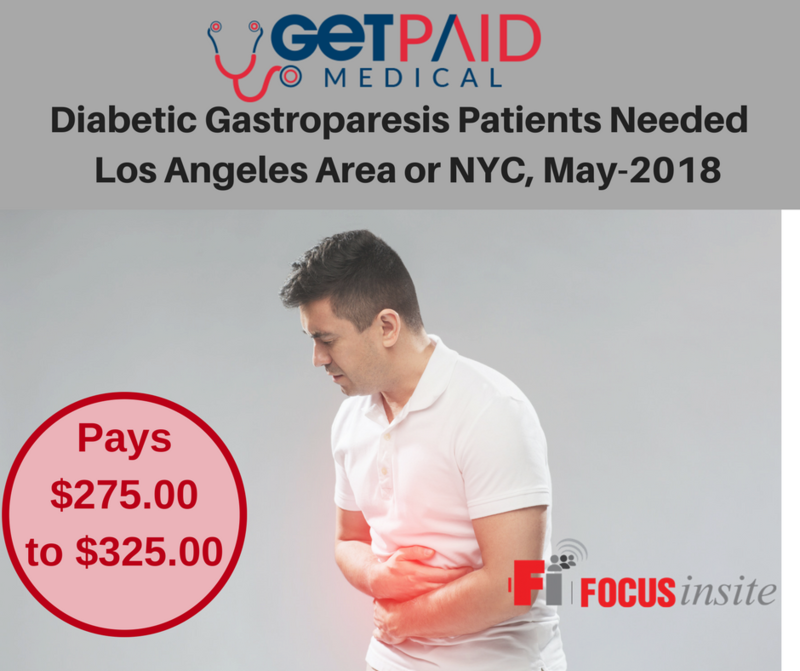 Our latest study is on a condition called Diabetic Gastroparesis.This occurs because the nerves that move food through the digestive tract are damaged, so muscles don’t work properly. As a result, food sits in the stomach undigested. The most common cause of gastroparesis is diabetes. It can develop and progress over time, especially in those with uncontrolled blood sugar levels. This study is taking place in person in either the Los Angeles area or New York City, however, we would be open to potentially doing this nationwide via web conference as well. This research is needed to improve treatment options and care for patients who suffer from these conditions. The type of research is vital for companies to develop treatments so future patients don’t suffer and can help advance science, and make money as well!